TED, the popular technology conference, has launched a new iOS app containing short eBooks written by TED speakers, with some including video and audio -- including TED talks -- embedded directly into the books. The success of TED Talks has demonstrated that millions of people around the world are hungry to absorb new thoughts and perspectives. With more demands than ever on people's time, we think many will welcome the chance to absorb a TED Book when a spare hour becomes available. 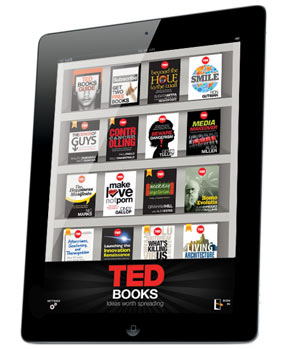 The TED Books app allows us to embed audio, video, and social features into each book, broadening the depth and detail of each work. These additional multimedia features suit the wide-ranging creative palette of our contributors, many of who use photography, audio, and video in addition to the printed word to fully express their ideas. PaidContent notes that the books will cost $2.99 each, or readers can subscribe to TED Books for $14.99 for 3 months worth of books. Additionally, those who sign up in the first 90 days receive access to all the books in the back catalog. It looks to me like it will be a stand-alone app and not in Newsstand... at least yet. Well, okay then - another App in one of the countless folders. I think Apple should set more strict guidelines about that. The NG and CAD are both monthly magazines and are in there. I understand that these are books, but now I will have the iBooks, Kindle, Nook, Knor, and countless stand-alone book apps (ICD 9, Bible, etc) still filling the real estate. This should either be in something like a Bookshelf App or you should be able to assign apps like this to the Newsstand. A good idea would be to rename the Newsstand to Library and have the "News" on the front and make it swipable to the book apps as a page to the right. But sadly, I don't have a say-so. Newstand is little more than a glorified folder, so at the moment, to have a “Bookshelf” that works the same, you just have put all those book apps into a folder together. But I like your idea of expanding what goes in Newsstand, to have ONE “special folder" for all “stuff you read.” I actually have nothing in my Newsstand, but I do have eBook apps and standalone books-as-apps. Wish I could stick them in there!